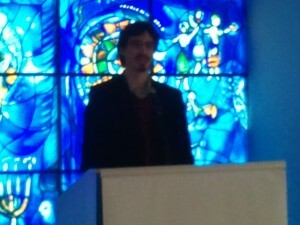 Hubbard St's Alejandro Cerrudo speaking at the Art Institute of Chicago in front of Marc Chagall's "America Windows". 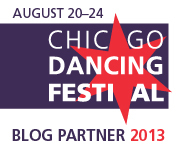 Chicago’s own Hubbard Street Dance Chicago (HSDC) hits the 35-year mark next fall. At a press conference this morning at the Art Institute of Chicago (AIC), HSDC Executive Director Jason Palmquist, Artistic Director Glenn Edgerton, along with AIC’s Associate Director of Performance Programs Mary Sue Glosser told a small gaggle of press about the exciting collaboration that will open the anniversary season next fall. HSDC Resident Choreographer Alejandro Cerrudo, a rising international choreographic star, will create the company’s first evening-length work on a central theme inspired by Marc Chagall‘s permanent exhibit, America Windows. 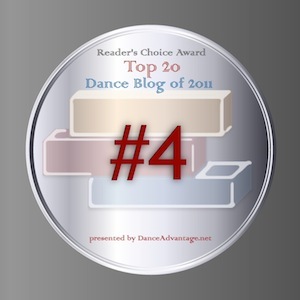 Glosser talking about the seven-year partnership with HSDC says, “seeing works of art come to life in their choreography…is a joy beyond measure”. Chagall’s stained glass masterpiece imbeds themes of music, painting, literature, architecture, theater and dance in a royal and cerulean blue swirl celebrating freedom of expression. The work made to commemorate the Bicentennial was given to the City of Chicago in 1977, the same year Lou Conte started HSDC, in honor of the memory Mayor Richard J. Daley. In turn, this new work will be given to the City of Chicago in honor of Mayor Rahm Emanuel and his commitment to making Chicago “a worldwide destination for dance”. Commissioner for the City’s Department of Cultural Affairs and Special Events, Michelle Boone accepted the honor on the Mayor’s behalf joking that everyone knows he’s “crazy about dance”. Edgerton took the mic telling us how all the connections came together to make this “a monumental season”. Cerrudo’s new piece, set to music by Philip Glass, will premiere during the company’s fall series at the Harris Theater for Music and Dance, October 18 – 21, 2012. The shy Spaniard took the opportunity say how grateful he was for the honor of creating this new work “in honor of the city that has become my home” and declared it a big challenge. Taking inspiration from Chagall, he will take the “magic, colors and emotions” from the windows to create a non-literal interpretation focusing on how all the pieces and people (dancers) come together. He suggested a working title of “A Thousand Pieces” for the full-company piece. The rest of the 35th Anniversary season will be announced later. Subscription tickets go on sale in May.